How Much Cement, Sand And Water Is Required For 12mm Thick Plastering? Plastering is done on the walls to remove surface imperfections, maintain line level and alignment. In addition to that it also acts as a protective surface for external walls. Cement plaster, Gypsum plaster and Lime plaster are the commonly used plastering materials for house constructions. Cement plaster is made by mixing cement and sand in the proportions required. Cement plaster is applied to both interior and exterior walls to give them a smooth surface. To arrive at the quantities of Cement, Sand and Water required for Plastering work, we need to understand on what parameters do these quantities depend. 2. Mix Ratio of Plaster: Mix ratio mean the ratio of Volume of Cement to the Sand used in the mixture. Plaster of mix ratio 1:4 mean that it contains one part of cement and 4 parts of sand by volume. Since the amount of cement and sand changes with the change in the mix ratio, it is one of the most important factors in determining the quantities. For calculation purposes, lets assume that the area that needs to be plastered is 100 sqft (10 ft X 10 ft wall) and a Plaster of Mix ratio 1:4 (cement:sand) is used. We shall use DLBD method (Dry Loose Bulk Density) in determining the ratios. This is the most accurate method as it accounts for the variations in the Loose Bulk Density. Loose bulk density might vary based on the location available materials. Usually around 20% of water by weight of the total dry material is mixed in the mixture to achieve the desired workability. Bulkage of Sand is not taken into account. A correction for bulkage has to be taken into account. Water needed would be = (56/0.153) x 0.12 = 44 liters. Note: Keep wastage allowance of 5% over and above arrived quantities. Volume of plaster = Area X Thickness = 10 sq.m. X 0.012 = 0.12 cu.m. The wet volume of the mixture is always less than the dry volume. Dry volume of motor required for plastering = 1.27 X Dry volume of plaster = 1.27 X 0.012 = 0.1524 cu.m. Cement required = 1/5 X 0.1524 = 0.03048 cu.m. Sand required = 4/5 X 0.1524 = 0.12192 cu.m. 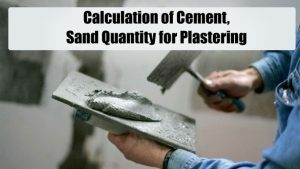 You can calculate the cement and Sand requirement for other Thickness of plaster and Mix ratio by just changing the numbers.